In a city where space and affordable housing stock are shrinking, a Seattle church decides to demolish houses where 10 formerly homeless people have lived for years. Bringing the houses up to code would cost the church a million dollars. Only one of the UUs — a casual term for Unitarian Universalists, whose roots began in Christianity but count many agnostic and atheist churchgoers among their numbers — asked about a cluster of three cottages on the property, which house 10 formerly homeless people. What would happen to them? Preserving the houses and bringing them up to code would cost an additional million. Instead, the church will tear them down — and replace them with 17 parking spots. 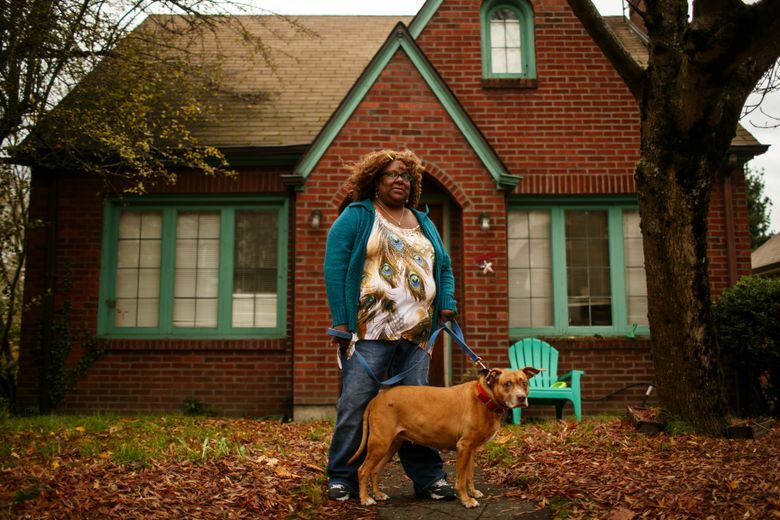 Brendi London has lived in a humble brick house on UUC property for four years with her dog, Ruby, an old and quiet pit-bull mix. Before that, she lived on Seattle’s streets. London said she suffers from severe depression, PTSD and anxiety, and does not want to move. The demolition of the cottages will affect only 10 people. But in a city experiencing a homelessness crisis, where affordable housing is melting away and where finding landlords willing to rent to people like London feels, to some social workers, harder by the day, every unit counts. Across King County, there are more than 2,300 single adults designated as most needy and who sit on waiting lists for permanent supportive housing, according to data from All Home, the county’s coordinating agency for homeless services. Darcell Slovek-Walker deals with this squeeze every day. Slovek-Walker is the CEO of Transitional Resources, a mental-health center that helps formerly homeless people get into supportive housing. Her agency is small, so Slovek-Walker knows each client by name. In the superheated Seattle-area rental market, she has seen landlords — even those who have rented to Transitional Resources clients — raise rents so high that federal subsidies won’t cover the cost. Finding a landlord willing to rent to her clients is already hard, but then Transitional Resources has to apply for the subsidy and the unit must be inspected. No one’s had to go back out into the streets yet, but it is getting harder and harder to find new apartments in time. So for her, every unit is really important. One night in June, London and the other cottage residents were told to come to the church for a meeting. She was nervous; it was her first meeting at the church. In fact, she’d never met anyone who worked there. There were whispers among residents, too, that construction workers had been walking on the property talking about demolition. London also saw churchgoers on the property putting their hands on the trees, praying and chanting; there was concern among congregants about the renovation’s effect on the trees. When London took a seat in the church, staff from Community Psychiatric Clinic (CPC), which provides case management for residents, told them about the pending demolition. They had one more year there. The Rev. Jon Luopa, pastor of the church, said UUC is expecting to grow, and the church is losing its street parking. Church members come from across the city and are running out of places to park. “It’s important to know what you can do, and what you can’t do, and where government needs to step up,” Luopa said. Representatives of CPC, which has run the homes for years, said they’re thankful that UUC provided the cottages — which they rented to London and others at cost — for so many years. But clinic CEO Doug Crandall admits the organization is feeling the same housing squeeze as others. According to CPC, London and others won’t end up on the street. The clinic will cover relocation costs, and London’s current subsidies will move to her new housing. But London is afraid she’ll have to live in denser housing with more roommates; she currently has two housemates. She still hasn’t met any of the people who decided to demolish her home. Church members intentionally don’t meet the residents of the cottages for privacy reasons, they say.